I hope your weekend was a relaxing one. Mine was full of play... and work that felt like play. Friday was my first day to get some sewing done... and I had used it to go pick flowers, as you may recall. I was so grateful when my husband offered to take the children out on Sunday and give me some time to get back in my burlap groove. I took my cutting board out to the picnic table and set to work to the sound of singing birds and our neighbors crowing roosters (they crow all day long!) If you've tried your hand at deconstructing a coffee sack, you'll understand how nice it is to be able to cut outside... less mess... lots of lovely jute scraps for those singing birds to soften their nest with, too. I'm hoping to have a mini shop update soon... my summer reality is all about slowing down, but I'm excited to put some new things on the shelves. I've had burlap pillows on my mind for months. It always feels so good to get an idea out of your head and make it real. I love how this first one turned out! Perfect for lounging on the deck, but just at home in my living room. My favorite little detail is on the back. 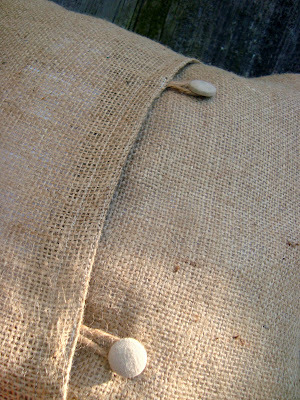 Jute loops fasten hand-covered linen buttons to keep everything in its place. I have several works all cut and ready to be constructed... I'll share as soon at they're done. Happy Monday! It's gorgeous Maya & your deck lounging shot is making me so envious. Thanks Kirsty, no need for envy (although I know it's warmer here than at your place) the lounge scene was strictly for the photo shoot... I was busy running around covered in burlap! That nice tall icy glass of lemon water: went to my son. I had just at much fun sewing, though! loving the burlap, you make great things with it! Maya, those pillows are very pretty! Are they scratchy? We have a roaster here in Kansas City that I know would have a lot of bags leftover for such a project. Is this the opposite of a lavender pillow ? The slight earthy coffee flavor meant to stimulate instead of sedate? A perfect photo of relaxation and renewal, as symbolized by your (yet again!) 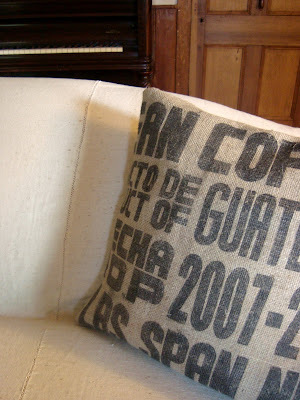 inventive repurposing of burlap. I'm loving those pillows! really beautiful! what a fantastic idea! you have such a great blog by the way!! 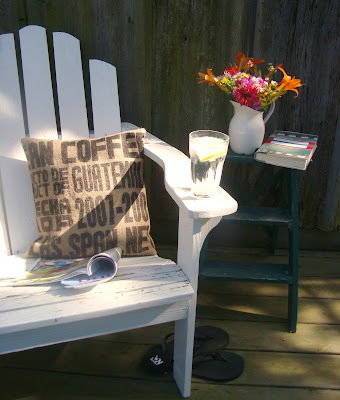 I stumbled across your blog and I have shared this cute pillow and other burlap ideas (and your link) on my blog! Love it!